Office Space - Marston Trussell, Northamptonshire. This office complex is located in a rural setting with fantastic views over the countryside. 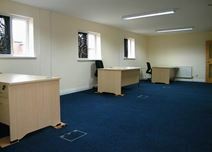 These high specification offices can be taken individually or in combination. These are tastefully converted farm buildings with a relaxed and airy atmosphere.